Protected areas provide great opportunities for active learning. 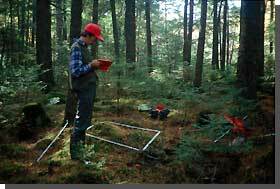 In addition to providing a living classroom for casual exploration, protected areas act as natural laboratories for ecological research. Annual outings within selected protected areas are led by protected areas staff as part of the provincial Parks are for People Program. Staff also make presentations on protected areas planning, biodiversity protection and related topics to university and college students in Nova Scotia, as feasible. Wilderness areas and nature reserves are set aside from intensive human uses such as agriculture, forestry, mining and road building. As such, they provide opportunities for research on biological diversity, ecosystems, and ecological processes as they occur naturally, with minimal direct influence of human activities. Protected areas provide opportunities not only for research which documents the natural world and tests hypotheses as to how nature functions, but also research which compares the structure and functioning of 'benchmark' natural ecosystems with ecosystems directly influenced by human activities. Such research can give insights into how we might modify our activities outside of protected areas in ways that lead to greater retention of native biological diversity and ecosystem function, both inside and outside of protected areas. Recent progress in establishing protected areas in Nova Scotia, particularly the designation of 31 wilderness areas which comprise about 5% of the province, means that Nova Scotia now has a significant land base, consisting of both representative and rare ecosystems and features, which can effectively be dedicated to ecological research and monitoring. Nova Scotia Environment and Labour will actively encourage that formation of partnerships in support of ecological research in protected areas. Additional information available on our Publications page.